Stop viewing surge protectors as a necessary evil! Necessary, sure – they help keep your expensive electronics safe from damaging fluctuations of electricity. But your surge protector doesn’t need to be an ugly, utilitarian brick. There are plenty of stylish and surprisingly well-designed options out there that protect your computer and look like a piece of tech you’d be proud to own. Don’t believe me? We’ve scoured the net (and stores!) to find stand-out, unusual and functional surge protectors worth considering for your home or office. Here are five of our favorites. 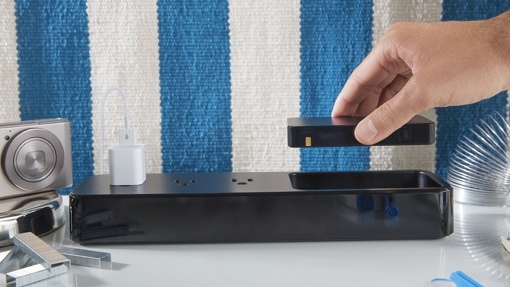 Quirky’s Pickup Power surge protector is, to borrow a phrase, more than meets the eye. On the top of the strip, you’ll find three standard sockets for all your favorite electronic devices. At the far end, though, you’ll find a terrific bonus feature: a removable 4000 or 6000 mAh battery with two USB ports that you can take anywhere to recharge gadgets on the go. It’s one strip with two great functions. Pickup Power is available in both white and black colors and provides a 15 A circuit breaker and up to 1080 joules of protection, which should be more than enough for most home applications (more is better). The 4000mAh battery version will set you back $99.99; the larger 6000 mAh version retails for $129.99. You can order your choice by visiting quirky.com. 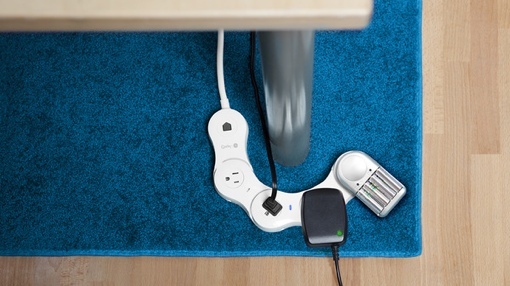 The Pivot Power Genius, also by Quirky, is another cool power strip that serves a dual purpose. The unique flexible strip bends to accommodate up to four oversized adapters, keeping them from blocking other slots. The bonus feature is connectivity to the cloud, which lets you control two of the outlets remotely from your smartphone via the Wink app. The Pivot Power Genius protects connected devices from surges up to 1080 joules and contains a 15 A circuit breaker. The device is available in white only and retails for $59.99. You can pick up yours at quirky.com. The Accell PowerSquid, too, wants to make sure you’re not wasting any valuable outlet real estate. But instead of the twisting and turning style of Quirky’s Pivot Power, the 3-foot long Power Squid has 5 flexible wire arms. It’s a good choice if you’ve got a lot of awkwardly large plugs and transformers, and are willing to sacrifice the ability to control them remotely for a lower price point. The high-end Power Squid is rated up to 1080 joules of surge protection with a 15A circuit breaker. You can buy yours in either black or white color at Amazon.com just $34.75. A lower-rated 600-joule model with a 15A circuit breaker costs $24.09 on Amazon.com. If you want to keep your hardwood floors looking clean and clutter free, take a look at the Invisiplug surge protector. This six-socket device is comes in three different faux wood plastic finishes, helping it blend right in with its surroundings. The 3-foot long cord is colored to blend in with your floor, as well. The Invisiplug provides 450 joules of surge protection with a 15A circuit breaker. It’s available in light natural, medium cherry, and dark oak colors on Amazon.com with prices starting at $15.99. Deluxe versions (shown) come with a pair of USB outlets and are available for $24.99 each. The Leviton T5280-I is easily the most minimalist surge protector of the bunch. Rather than sitting on your floor, this surge protector receptacle is installed directly into the wall as an outlet (you may want to hire an electrician), giving you round-the-clock surge protection. The catch here is that you only get two sockets. Still, it’s a great option for any location you routinely find yourself using your laptop – near the kitchen counter, in the bedroom or by the living room coffee table. The Leviton T5280-I provides 720 joules of surge protection with a 15 A circuit breaker, but is only capable of protecting against one surge. It’s not resettable, so it essentially becomes a standard wall outlet after. It’s available in seven different colors on Amazon.com for just $31.88. surge protector much better than power strip! One of my friend live in the Colorado mountains at 10000 ft elevation. The house sits on a large rock outcropping just barely covered by dirt. Storms build here before moving out east to the plains. The rock outcropping is a great attractor of lightning. Before using the Ankway surge protector they lost many a phone and modem if they forgot to unplug the phone lines. they got hit with lightning last week, enough to rattle the windows, and the surge protector took the hit and protected the phone. For me there never seem to be enough places to charge all the electronic devices in the house. I have been looking for a desktop AC outlet solution like Ankway for awhile, finally i got it from Ankway http://www.amztk.com/ankwaysurgeprotectorwithusb they makes a lot of sense. 1700Joule rating and 2 AC outlet with 5V8A 5port Smart charger, I really love it!